I met him at Paul Owens Training Facility at Carpenter Complex, the Philadelphia Phillies spring training facility in Clearwater, Florida in 2015. Aaron signed an 8x10 photo. As he was signing my picture, his sweat was constantly pouring onto the picture. He apologized and attempted to wipe it, but more just kept dripping. I told him it wasn't a big deal. If you look closely you can see the stain marks from his sweat. I say it gives my signed picture more character, plus, a story I'll always remember. UPDATE: A year later, the autograph has almost completely vanished from the picture. Apparently, ink and sweat do not mix. Thankfully, the following spring, I was able to tell Aaron what happened to this image. I don't like asking for autographs once I already have that person's signature, but I really wanted to replace this image, so, I asked Aaron if he'd sign a card for me. 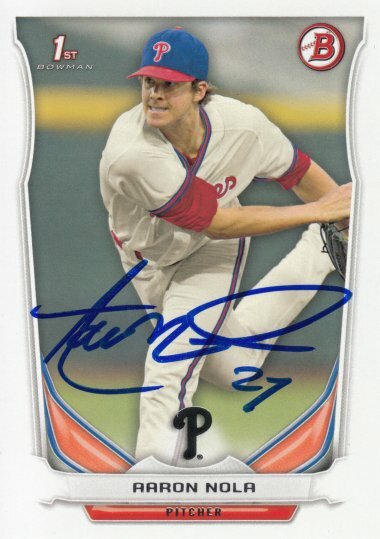 Aaron signed a 2014 Bowman Draft Picks & Prospects card #DP4. You should post a pic of that photo now, if you even still have it.